Video Surveillance - Structured Cabling Raised Flooring Control Systems Maryland | Smart Space Solutions, Inc.
As a structured cabling solutions experts, Smart Space Solutions also offers the installation of wired and wireless video surveillance systems for entrances, parking areas, interior areas, rooftops and more. We can design a system where only authorized personnel can monitor a building or facility at its location or remotely from anywhere in the world. Call us today for more information or for a free consultation. 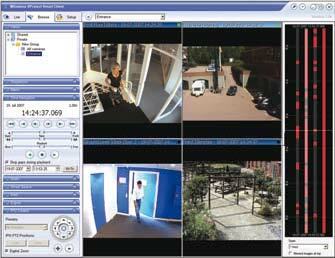 Video surveillance is the use of video cameras to monitor specific locations on a limited set of monitors. It differs from broadcast television in that the signal is not openly transmitted, though it may employ point to point (P2P), point to multipoint, or mesh wireless links. Though almost all video cameras fit this definition, the term is most often applied to those used for surveillance in areas that may need monitoring such as banks, casinos, airports, military installations, and convenience stores. In industrial plants, video surveillance equipment may be used to observe parts of a process from a central control room, for example when the environment is not suitable for humans. Video surveillance systems may operate continuously or only as required to monitor a particular event. Video surveillance utilizing digital video recorders (DVRs) provide recording with a variety of quality and performance options and extra features like motion detection and email alerts. Decentralized IP cameras equipped with megapixel sensors support recording directly to network-attached storage devices or internal flash for completely stand-alone operation.